I’m hoping for a pretty easy weekend, the work week was short but rough. Putting away the last of the Christmas decorations today. If the rain holds off, I’ll get on the roof and get the lights too. Having some friends over for the game tonight, so we’ll be madly cleaning the house before they arrive. Tomorrow should be nice and easy. Took it easy this morning, then went up to the shop and worked on the Bronco a little. Well we seem to be having a nice wind storm. a transformer go BANG after the lights were back on. can kill just by getting close to them with this wet ground.. I saw the notifications go up on twitter at like 8pm during the end of the Seahawks game. Winds registering in the 60s all around Seattle metro. Duvall, Tacoma, Grays Harbor. Barely a whiff up here in Lake Stevens as far as I can tell. Looks like easily over 100K people without power at the moment. Should be dying down soon and over with by the time most folks wake up. Got all the décor taken down outside and cleaned some more of the garage. Finishing up vacation this weekend and then it's back to the grind for me Monday. It was closer to 10:00 PM when it started around here. That is when I want out to check the tarp. Looks like we are all up early this morning. The wind woke us up multiple times. Our power flickered, but never went out. It’s going to be a big-coffee morning. Sad about the Seahawks. I put all the Christmas stuff away yesterday and now I have to do the same for our blue and green swag. Hi guys, No wind over here in the center of the state. Sunny and warm today, close to 60 degrees mid day! Decided to give the truck a once over at the car wash! I'm going under the knife on the 16th. Going to have my left knee replaced. They both need replaced but decided to do one at a time. 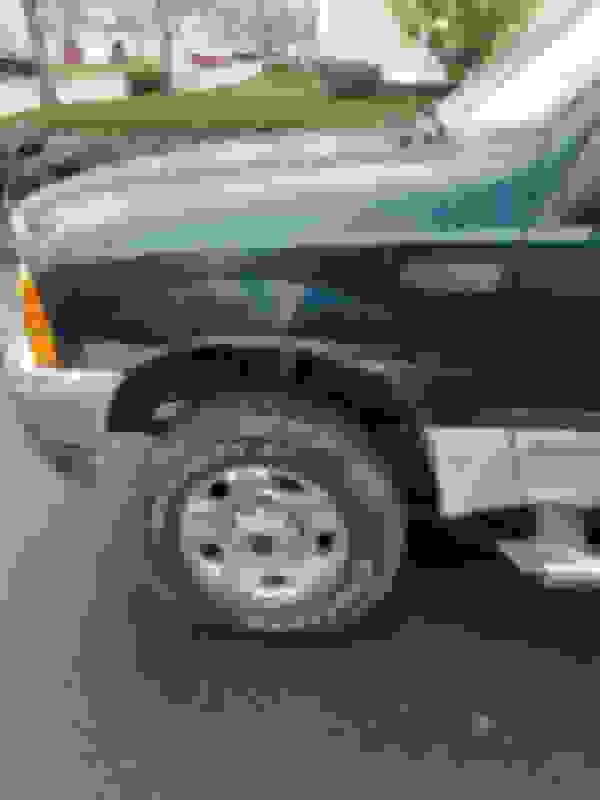 I’ve always loved that generation of dually fender. Great looking truck. when it comes t recovery. Everything went well with that Knee. Tim best wisher to you and a fast recovery. Thanks guys, Not looking forward to the operations or the recovery, but looking forward to the end result. 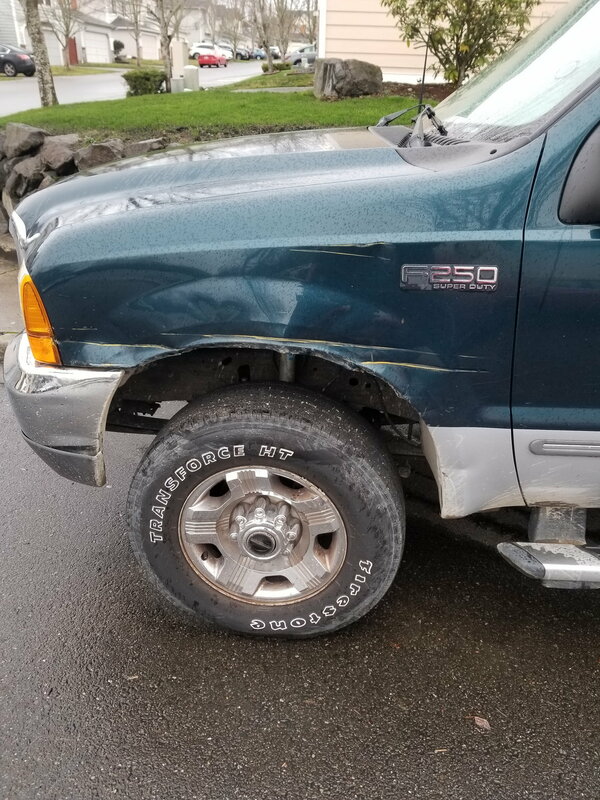 Truck was hit while parked by a School Bus this morning, waiting for local district to get back with me regarding insurance. Well ****, I hope no one was hurt. I will have mine back Thursday. Ouch, that looks like a solid hit. Truck was parked. Actually been parked there for a while. I occasionally drive it to charge the battery, but haven't been using it. Might lead into my upgrade plan, will see how this turns out. I would like to replace the mirrors with a 08+ style, bed line the lower grey section and see about getting my headers Installed as this will be the last year for emissions.